By now, the mainstream consumer is all too aware of the collapse in crude oil prices. Crude oil futures continue to slide, reaching five-year lows and generating concerns about a deflationary death spiral. The future price of commodities and the nature of deflationary or credit-contractionary forces have been the topic of great contention and speculation. Without a well-equipped background in economic theory, investors are left playing darts in the dark, while the dartboard remains in the other room. Let's take a ride on the helicopter of heterodoxy to examine this economic scenario from a bird's-eye view. Upon completing this article, the reader will better understand the forces of the modern economy, and he or she will be well-equipped to describe the future of the dollar, how those commodities will be priced in it, and why deflation is the saver's reward for continued cost cutting, efficiency, and overall market-generated prosperity and greater economies of scale. If you haven't noticed, the real price of oil, as denominated in stable forms of money over the past century, inclusive of scores of geopolitical tensions and market shocks, as may be demonstrably illustrated by the commodity's pricing in gold, silver, and other precious metals, has remained largely predictable and stagnant or has progressively declined. The current state of the United States dollar is a position of relative strength, based upon a diminishing status as a global reserve currency and a subjective index exclusive of an array of competing and revealing currencies. Moreover, short-term price movements can be rather misleading, and they often obfuscate underlying fundamentals. In this case, beyond more elaborate dynamics and technical aspects, the proximity of the trading price and the marginal cost of oil production is rendering infeasible further oil investment and drilling. With the gross expectation of the continued expansion of demand, as reported by the IEA, matched with reduced capacity, falling oil prices will be all but short-lived. 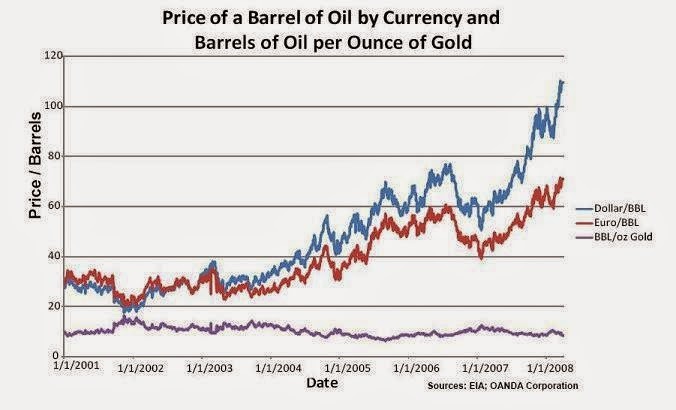 You may periodically refer back to this article over the course of the next decade to recall this forecast: the price of oil, in terms of USD, will increase significantly, perhaps exponentially, while its gold and silver prices will continue their trend of relative stability or decline. This is a function of supply and demand, and the remainder of this article will address the regression of demand which will accompany a continued burgeoning supply of US dollars. One of the other major forces signaling a promise of a higher dollar price of oil is that of monetary policy, rooted in the state's capacity to manage nominal interest rates and the supply of money and credit. First, a normalization of interest rates in the United States is highly unlikely, as the United State's national debt renders impractical such interest payments, and a resumption of quantitative easing, along with its zero interest-rate policy, is nearly a foregone conclusion and a dire necessity in order to sustain those asset bubbles engineered by previous Federal Reserve administrations. Across an array of mainstream media outlets, United States politicians and talking heads express their blind and blissful ignorance in accepting the widespread fantasy of economic recovery. Their unsophisticated acceptance at face value of the official jobs numbers, and their expectation of a continued decline in the dollar price of oil, collectively displays their lack of understanding over the critical monetary situation facing the United States. The United States dollar has successfully masqueraded as a strong currency, with a tradition of mere nominal and relative advantage over real decline during the past century, especially over the past decade, and in an even more pronounced fashion since the 1980s. A scenario which is more likely than that with which the mainstream concludes is a continued appreciation of the Chinese yuan against the United States dollar. Despite the desperate position of the United States in the international picture, including its recent achievement of $18 trillion in national debt and its record-setting trade deficit in manufactured goods, its domestic capacity is a mere vestige of the economic powerhouse and bastion of prosperity and production it once sustained. For instance, the employment numbers are lackluster at best, indicating an aggregate conversion of full-time employment to part-time, a mass exodus of retirees returning to the labor force, and a net loss in the overall figures, as fewer jobs are being created than those which are lost. In the end, the United States lacks the industrial and manufacturing capacity to sustain, of its own might, the venerated global reserve status, and its position continues to diminish each year. 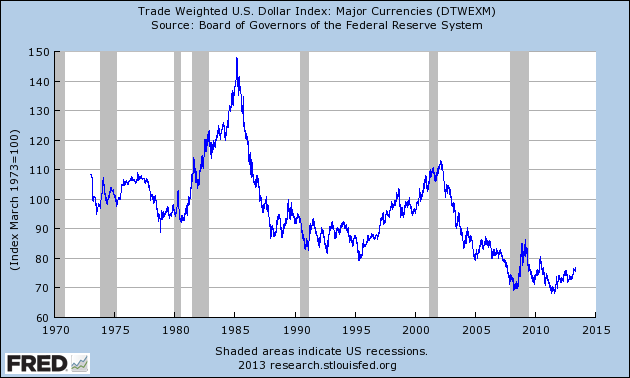 The relative strength of the United States dollar will endure only so long as its reserve status remains intact. Moreover, investing in the United States dollar, which can take the form of USD-denominated savings, equities, or bonds, is one's tacit acceptance of the notion that the United States can continue to afford its massive welfare state and entitlement programs, chief among them Medicare, Medicaid, and Social Security, along with its enormous police state, which has by now claimed 25% of the world's inmates, and its global war on ubiquitous, ill-defined terror. All of this is to be sustained ostensibly by a market whose national debt eclipses its annual gross domestic product. After pricing commodities in terms of Japanese yen, while Japan has officially reentered recession after successive quarters of contraction, an $81 billion stimulus package, and accelerated increases in consumer prices and money supply, one might uncover the eventuality for the United States dollar, only the dollar's case is a story of far greater magnitude. Oddly enough, economists who still fail to understand the causes of the last crisis are now calling for more government spending to supposedly spur economic growth. These economists simply misunderstand the real basis for economic growth. Growth stems from savings and production, not from the destruction or reallocation of those resources. This most commonly results in the boom-bust cycle encouraged by those artificial moral hazards and systemic distortions which drive malinvestment. All of this simply calls for more quantitative easing and inflation. The engineers of the macroeconomy, those at the Federal Reserve and in public office, wish for nothing more than the perpetuated illusion of economic progress, which most notably appears on the mainstream radar through employment figures, manufactured GDP data, nominal wage growth, and nominal wealth creation in asset prices and the stock market. For this reason, those who hold US dollars can expect to experience a continuation of the dollar's collapse to prop up these nominal values in assets. Unfortunately, people will continue to neglect that falling prices are desirable all across the board. They are largely easily convinced that prices will remain static as their own wealth appreciates in nominal terms. This is, of course, untrue. As we can observe today through the trends in the dollar price of oil, falling prices enable real demand, a lower cost of living, a reduction in the costs of production and transportation, and a higher standard of living. This is the ultimate end of economic development: to reduce the overall cost of living and production to enable a maximum quality of life. Unfortunately, however, American oil companies can ill-afford to produce at these price levels. Recently, Texas-based Comstock Resources announced that it will suspend some of its oil-directed drilling in its Eagle Ford shale properties. Clearly, a global supply glut and its accompanying shallow price levels have rendered infeasible domestic production in the United States. This is yet another application of market forces: allocating capital and labor where it is most efficient, and rewarding efficiency with market share, while eliminating or redirecting production in less cost-effective markets. In the end, geopolitical trends indicate a continued departure from United States dollar reserves, as China and Russia, among others in and connected to OPEC, have declared their reluctance in holding further US Treasuries. This is noteworthy news, yet your local stations have likely failed to report on this or any other serious developments regarding this narrative. The reality is that the United States has lived far beyond its means for far too long, and the mass producers of the world, namely China and its fellow emerging markets, will soon experience the fruits of their labor in the form of appreciating currency and purchasing power. A palpable glimpse into this stunning economic shift can be revealed by a tour of the city of Detroit, a city which once stood as a beacon of American industrialization, mechanization, and automation, but has since collapsed under the weight of excessive artificial market regulation and state-induced poverty, crime, and subordination. In fact, the city of Detroit once enjoyed the highest GDP per capita in the United States, while the United States boasted the highest GDP per capita in the entire world. These trends signal only one direction: the continued decline of the United States dollar.